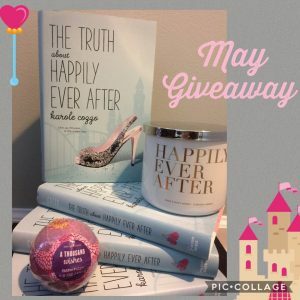 For our May contest, we’re celebrating Sweetheart Karole Cozzo’s May 16 release, The Truth About Happily Ever After. In this sweet YA/NA romance, Alyssa works summers at a theme park playing the role of Cinderella and looking for her own fairy tale love story. Alyssa is a princess at heart, and nothing makes her happier than seeing the wide-eyed stares and smiles of the little girls who come through the park to meet her. Make sure you’re following us on Twitter. Leave a comment below and let us know which character you’d choose and why. Be sure to leave your Twitter handle at the end of your comment so we can reach you. The contest closes May 31 at noon. We’ll choose a comment at random, and the winner will receive a pampered princess prize pack, including a copy of Karole’s book and some swoony swag! I think I would be Cinderella because I love the idea of letting kindness be your guide and I would want to spread that love and positive energy to others. My twitter handle is @cindercyborg. This book looks like so much FUN, plus a perfect summer read. As for what character, I think I’d like to be one of the villain queens… like Maleficent or Ursula or Mother Gothel… I would love being able to play off of the other characters and park goers. What a fun question! I think I would want to be Maleficent or Meirda. Maleficent because sometimes it’s fun to be evil and scare people. Merida because she is a strong female, who loves to be adventuress and learn, but still has some lessons to learn. Ooh, good choices. Those cheekbones! That hair! In case you’re wondering how she does it! Wait. If you want to wear a yellow gown, you should wear a yellow gown. Belle or no Belle! Do it!! Woah! This is really hard. I’m not really into mascots. Does being a performer in those parades count? I just find them so cool! But if it really has to be a mascot, being Vanellope from Wreck it Ralph would be sooooooo cool! Ahaha! Did you know her last name is von Schweetz? She’d fit right in around here! Love it! Hooray for reading on the job! And good luck in the contest! Not eligible either, but I would totally want to be Poppy from the Trolls movie. Because glitter! Esmeralda from The Hunchback of Notre Dame, because I love her costume and her attitude. And I’d love it if I could have a companion goat by my side! Yaaasss! The world needs more Judys! I’d love to be Rapunzel. I’ve already got the long hair (though it’s not blonde anymore) & I’ve got mad skills with a cast iron frying pan (though I use mine for cooking, not as a weapon). How fun! Did the proposal involve a glass slipper? I would love to play Ariel, she was always my favourite growing up and Ive always loved prince Eric! Ooooh, now THAT would be an adventure! Rapunzel because she has long hair that you can put up in pretty braids to attract people and she reads! Her commelian(I think that’s how you spell it, lol) from the movie tangled could put on a show. Plus, they’d put you in a tower, so you’d have a great view of the park all summer! Ahh it’s so hard to pick one, but if I had to I would be Belle from Beauty and the Beast. I’ve always had such a love for her and from the time I was little I was told that I was like her in so many ways! I have a chronic illness and since I was diagnosed with it, books have become even more important to me. Being able to escape into a different world for a little while has saved my life so I can absolutely relate to Belle’s love of books. Lovely! Thanks for entering and good luck!